The J.J. Robinson Trust extends its heartfelt thanks to the Rotary Club of Poole (UK). 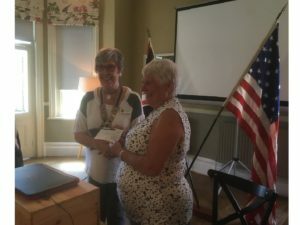 Club president Georgina Brooks is pictured below presenting a cheque for £2000 to Trust President Jean Robinson at a recent meeting. The Rotary Club of Poole forged links with the Trust when Mrs Brooks and her husband, Peter, visited Grenada in 2016. Since then President elect Babs Plumbridge has been to the island and seen the Trust’s work at first hand.